This proposed research will develop a new facial modelling and animation approach which incorporates data and physics driven techniques and ordinary differential equation-based sweeping surfaces into a single framework. This research aims to develop a new technique of efficient and realistic skin deformations for human body animation through integrating data-driven methods and physical deformations, implement the technique into a software tool, and exploit its industrial applications in quickly producing realistic human body animation with a small data size. 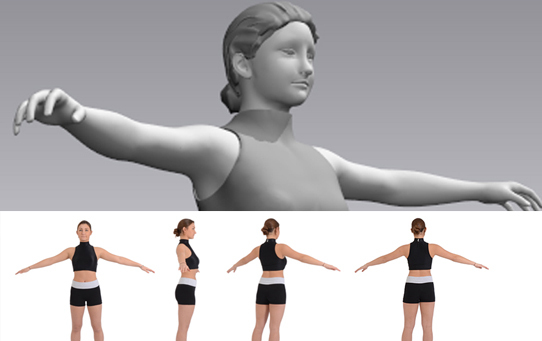 The basic idea is to reconstruct 3D skin models from real human movements at few poses, transform the models into physical ones, develop a mechanics model and accurate and efficient solution of physical deformations, and create new skin shapes through interpolation and training of the solution from reconstructed 3D skin models. This new technique will greatly reduce data size, improve realism, and raise efficiency of human body animation.